I remember the first time I saw a data projector used in a church service. The unit was the size of a carry-on piece of luggage and it also acted as a convergence device with a built in VCR! Today, you would be hard pressed to find a church without some integration of a data projector into the worship or teaching time. Powerpoint/Keynote – Both Microsoft and Apple have presentation software that can be adapted for church use. They have the best feature set and graphic options for presentations. You can create video announcements and dynamic slides if you combine iMovie (live motion) and Keynote (still frames). You’re looking at $100 for the Apple iWork suite or $150+ for different versions of Microsoft Office. Ultimately, you trade the flexibility of creating anything you want with a custom-designed workflow that is better suited to a church service. For example, how do you manage a large library of songs for weekly services? Copy and paste? I don’t think so. 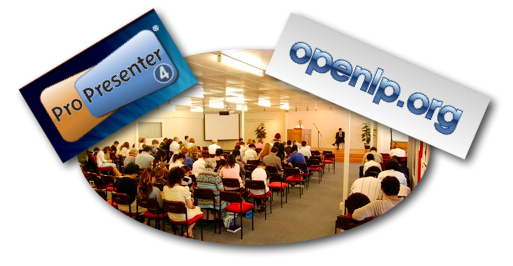 Open LP – Open LP is a free cross-platform tool specifically designed for church services. 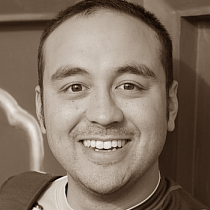 There is a passionate community behind Open LP with a track record of adding features and support. You’ll find library management , integration of CCLI licensing and savable service orders. As a Mac user, the Mac version isn’t as mature as the PC version but it all works. Also, it’s hard to argue with free. ProPresenter – The team at Renewed Vision have taken presentation software to the next level with lots of features aimed at a large congregation. You’ll find things like DVD pre-syncing (so there isn’t any lag), centralised song management on a web server (so you can have one database with multiple users), and a wireless monitor tool that lets you broadcast the presentation to an iPad on the lectern. Here’s the catch – it costs $400 for a non-concurrent license and the most mature feature set is only available for the Mac version. Our church uses ProPresenter (after two years of Keynote) and I can definitely say that dedicated church presentation software is better than the standard office programs in a church context. I would love to hear about any other programs that I’ve missed and the combo that you use for your church. I use Powerpoint occasionally in our mid-week teaching time and I find it helpful when others use it properly in their teaching. While I don’t want to sound like a ‘stuck-in-the-mud’, I wonder if the regular incorporation of a visual element into our church services takes away from the simple appreciation for the Word preached. We have become a very visual society and I would hate to get to the place where people need some kind of visual element in order to receive the Word. The use of visual elements is good as more and more people are visual learners. My big problems with the use of slides etc come down to 2. 1) A lot of people rely so much on them that a technical fault can halt or wreck a good sermon. That should never happen. I am looking for a church or churches in Melbourne, Australia that are using propresenter that might be able to advise my church as we make the transition from powerpoint. I’ve found the training videos sketchy, and the manual overwhelming but still with gaps.